This Level 2-course runs over 2 days and is the course where intermediate and advanced Clinical Pilates exercises are taught. 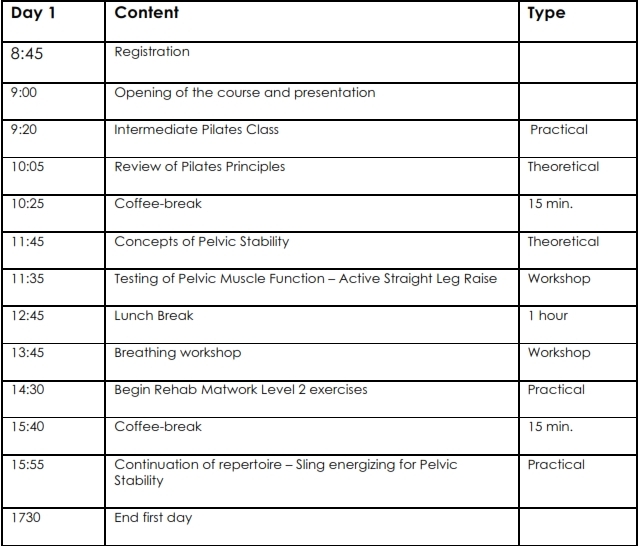 Higher level scapulo-thoracic and pelvic stabilisation exercises form the core of this course. 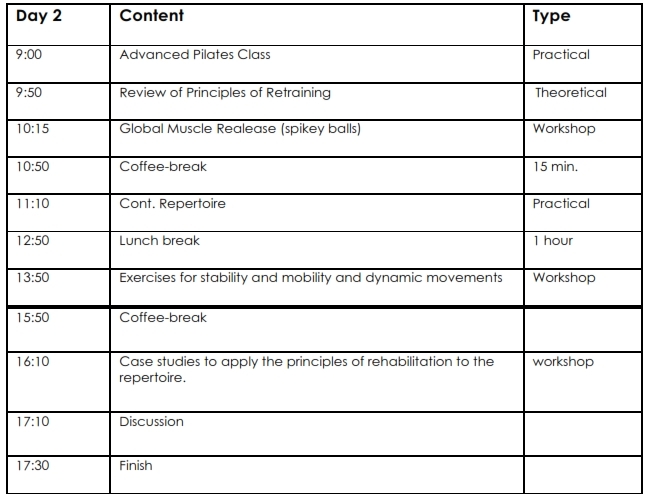 The course builds upon the movements, understanding, cueing and exercise selection from Matwork Level One. The conversion from beginner to more advanced movements will facilitate the unique shift from just stability to strength and conditioning. This progression from rehabilitation to full health and fitness is a crucial process to achieve your clients’ goals of a full recovery. This course allows the physiotherapist to be competent in working not just with injured clients, but to begin the transition to fitness or preventative programmes. It will give the physiotherapist a greater range of exercises to continually challenge the client, and maintain compliancy to the treatment. – Exercises for training lumbo-pelvic, scapulo-thoracic, cervical stabilization and spinal mobilisation. – Strengthening of the global muscular system. – Practice teaching and observation. – Review case studies, design and discuss treatment plans. 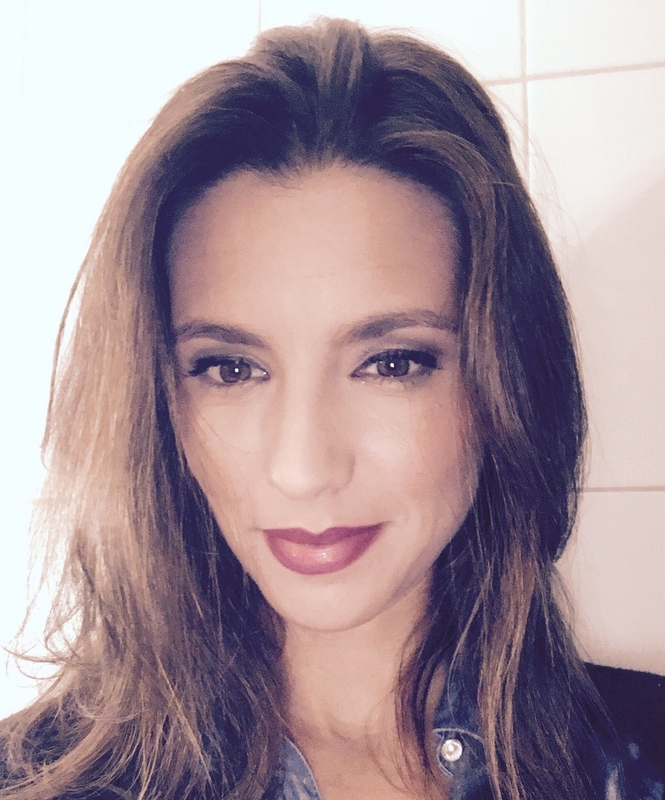 U kan enkel deelnemen aan deze opleiding indien u de Pilates Level 1 heeft afgewerkt bij SmartEducation! Doelgroep van de cursus : Kinesitherapeuten, sportkinesitherapeuten, manueel therapeuten die reeds deelgenomen hebben aan Level 1. 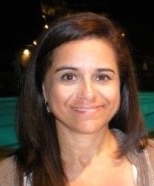 Elisa Petiz studeerde kinesitherapie in Portugal (Escola Superior de Tecnologias da Saúde do Porto) en behaalde een masterdiploma in ‘Science in Physical Activity for the Elderly’ (Faculdade de Ciências do Desporto e Educação Física da Universidade do Porto). Zij studeerde verder in Australië in de opleiding ‘Orthopaedic Manual Therapy ‘(Curtin University) en behaalde tevens een diploma ‘Clinical Pilates Lecturer andInstructor’ bij Balance & Control Pilates Education. 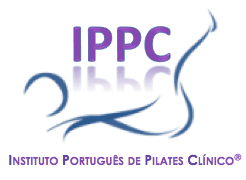 Zij werkt in een zelfstandige praktijk en is tevens co-director van het ‘Instituto Português de Pilates Clínico’ (Portugal). 20 available	 pilates level2 - 5-6dec19 €470,00 50€ (excl btw) cateringkosten inbegrepen in vermeld bedrag.